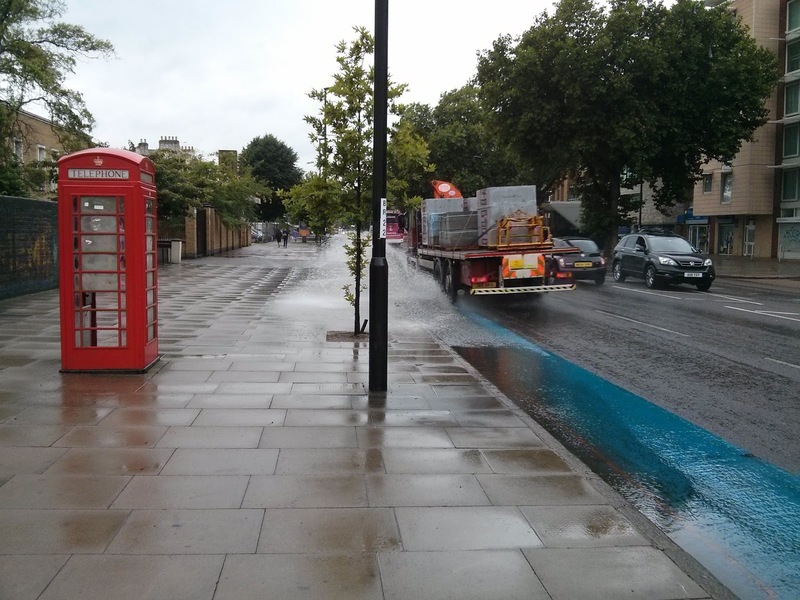 Why are Hackney's segregated cycle lanes being removed? 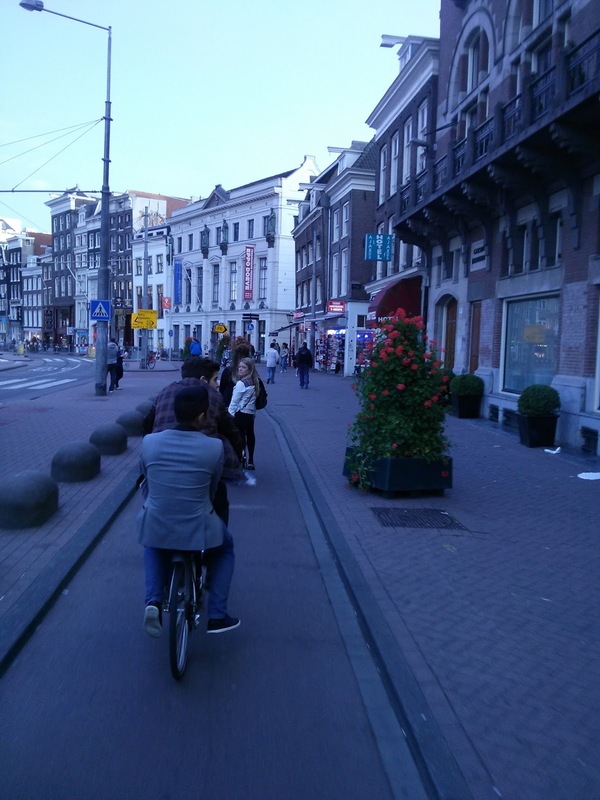 Across the world they're slowly copying the dutch and building segregated cycle lanes. From New York to Moscow and from India to London. Not surprising considering countries that build dedicated infrastructure for cyclists generally have a very high number of trips by bike and countries that mix cycling with fast moving motor traffic generally get very low model shares. You don't need to be a rocket scientist to figure out why. 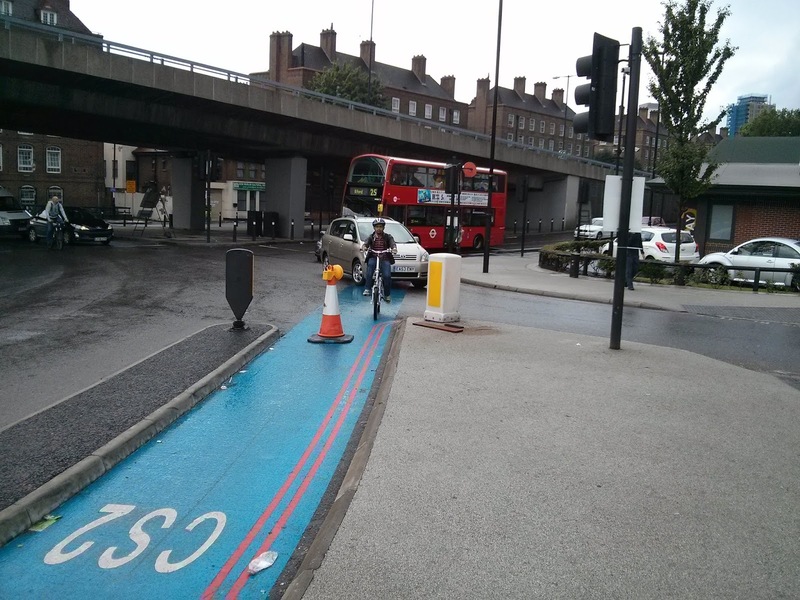 The vast majority of people in London do not cycle because they don't want to cycle with traffic but would if there were dedicated cycle lanes built. In my neighbourhood though they don't agree with this. Members of my local cycling campaign group regularly argue against cycle lanes on twitter, on blogs and on cycling forums. 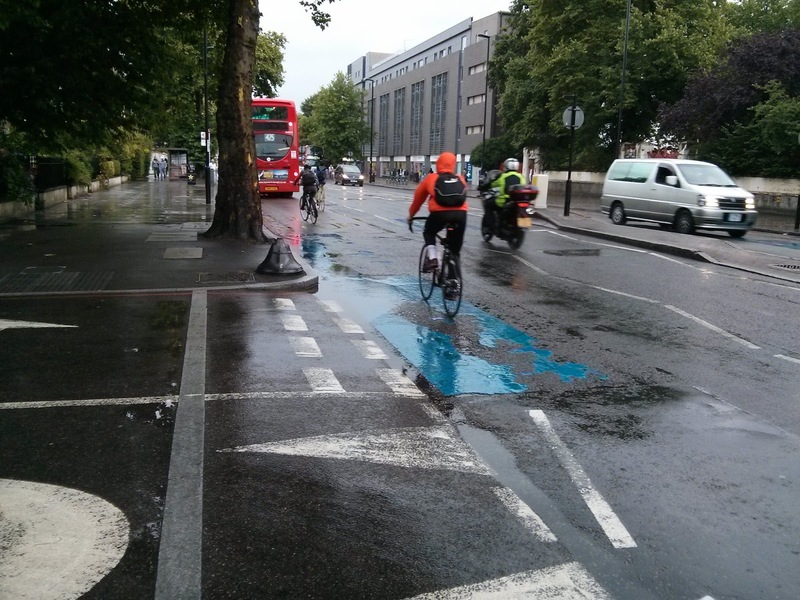 They also have a link on their website to negative research on cycle lanes, by John Franklin. 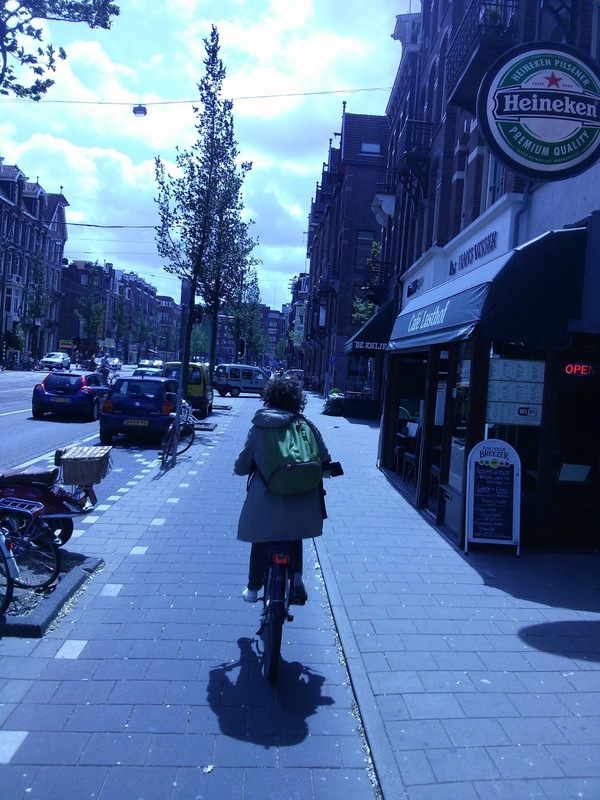 Hence why 97% of children in Hackney do not cycle to school, compared to 53% that do in Amsterdam (89% across the Netherlands). 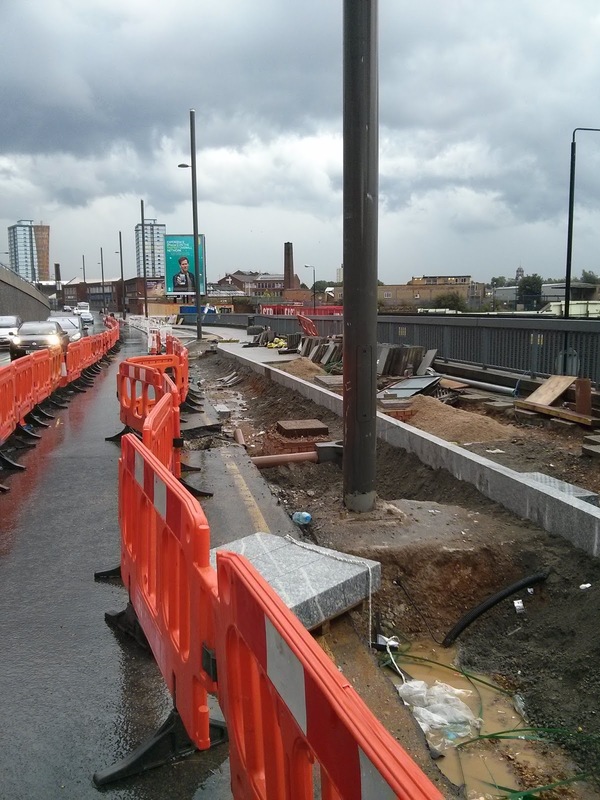 So whilst others are finally getting on with building segregated cycle lanes, here in Hackney we're busy ripping them out. Here are a few examples. 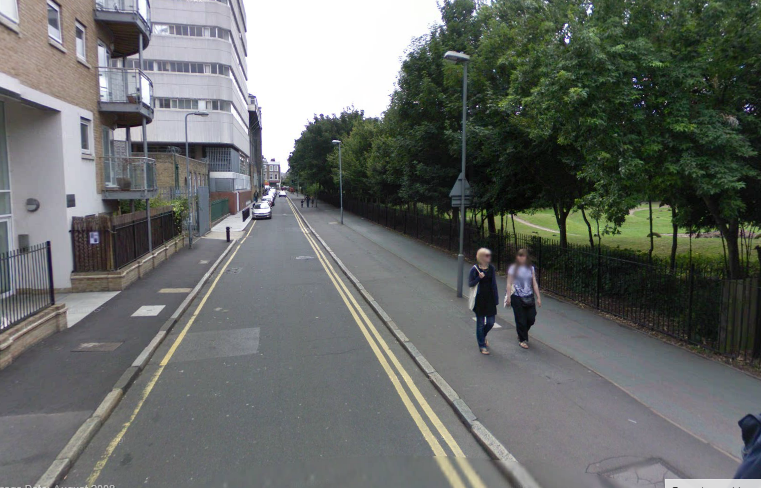 This, along with London Fields is probably the area of Hackney that has the highest number of people cycling. From looking at a map you can see why. 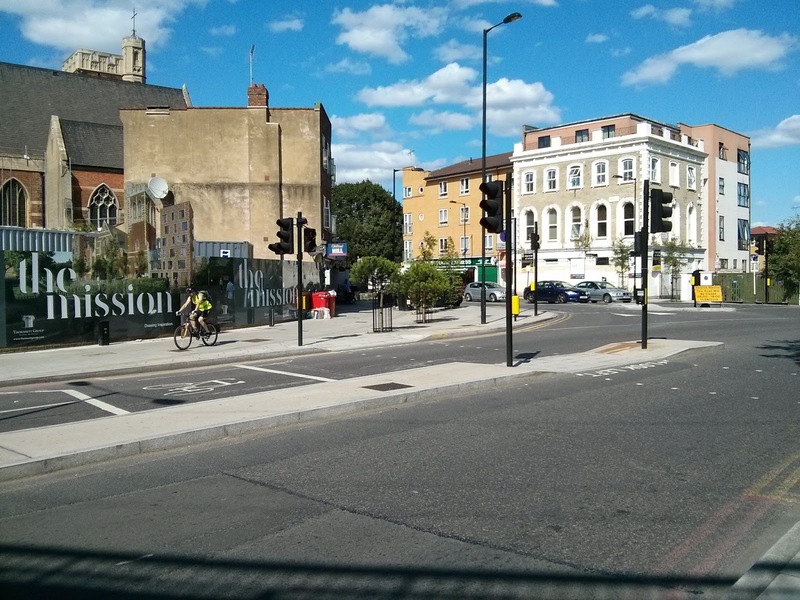 It links Hackney Central to Hackney Road via London fields so was always going to be the most popular route for people cycling from Hackney towards Shoreditch or Whitechapel as it is the quickest and shortest route. 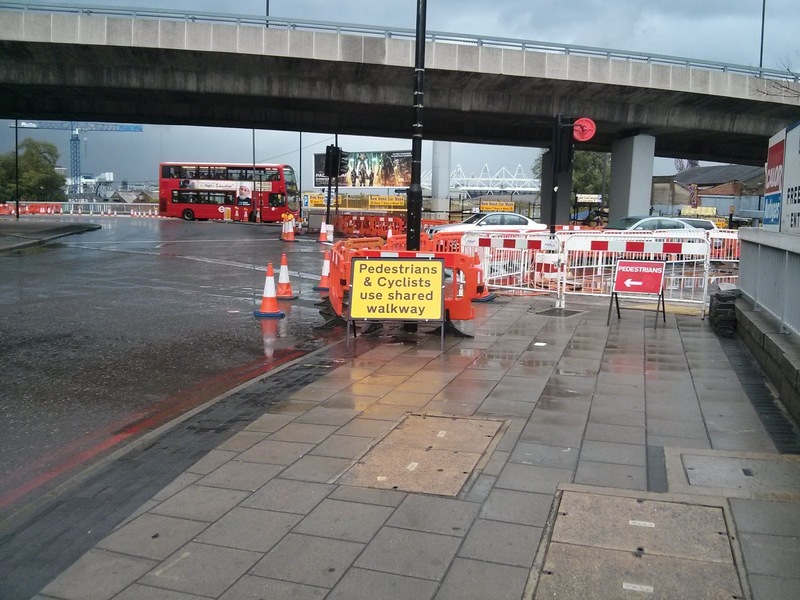 Even if it had no cycling infrastructure at all it would still continue to be the busiest route for people on bikes. 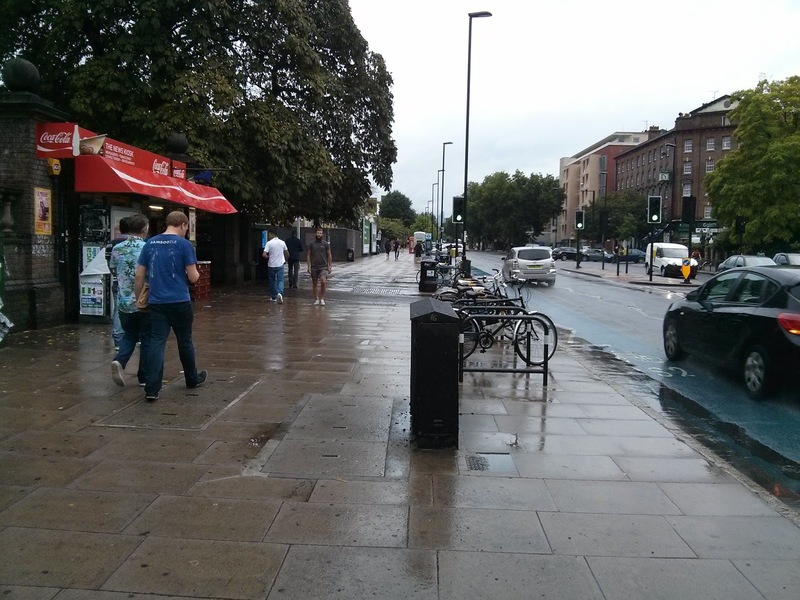 Goldsmith's Row used to be a busy rat run so was closed to motor vehicles last year leaving it open to cycles only. Now many people will argue that this change is for the better and they'd have a very good argument. Goldsmith's Row is a marvellous route to cycle along and they've recently installed a cycle counter on it, as you can see in the picture above. 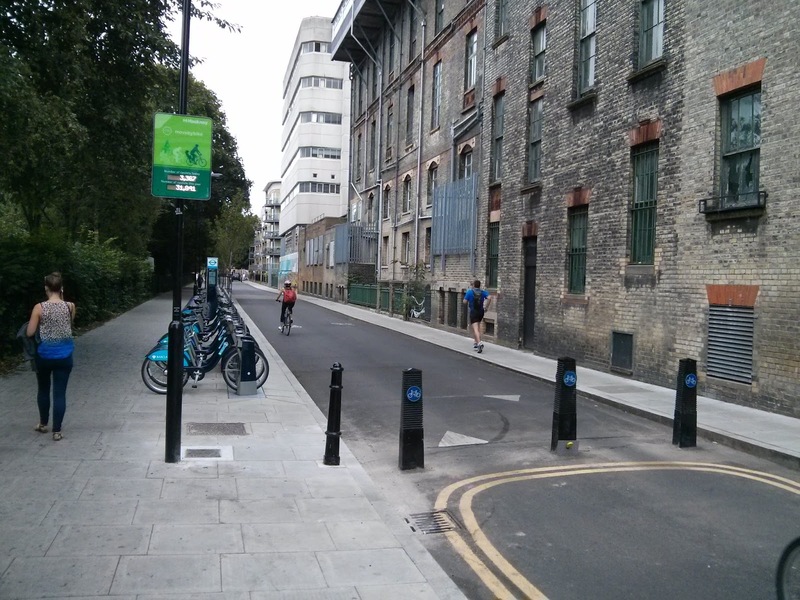 However is was already a very good cycle route and had a perfectly decent enough segregated cycle track. 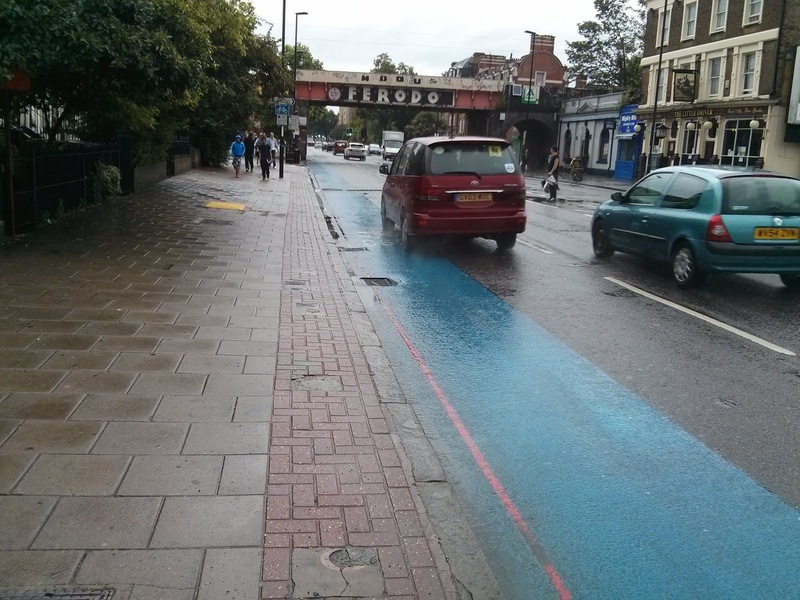 It was already one of the best roads to cycle on in Hackney so you could argue that the money spent on this could have been better spent installing infrastructure elsewhere, or continuing the cycle track up to Broadway Market. 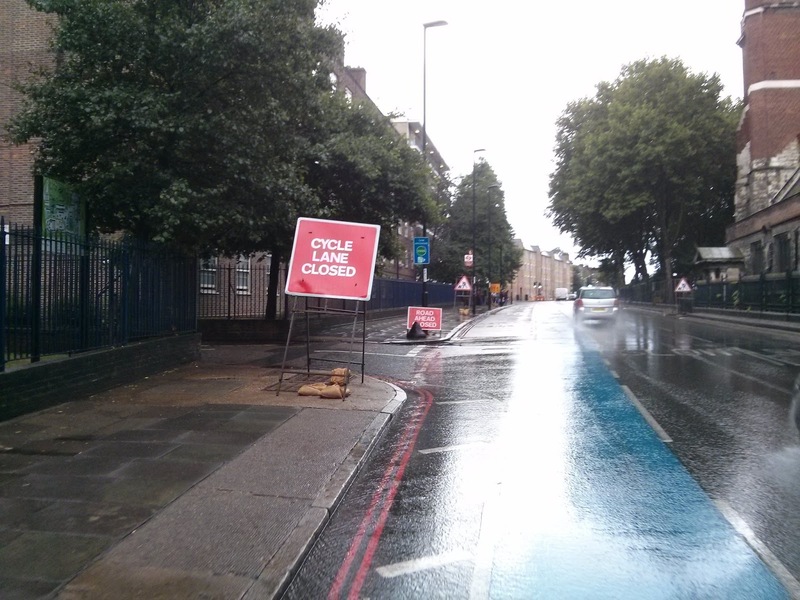 The derelict Queen Elizabeth hospital for children that runs along the road will soon be converted into 188 characterless flats so it remains to be seen if this road will remain open for cycles only. I've mentioned this road before. Originally built as the link road to Stratford International station it never opened as between it being built and being opened London won the bidding for the 2012 Olympics. 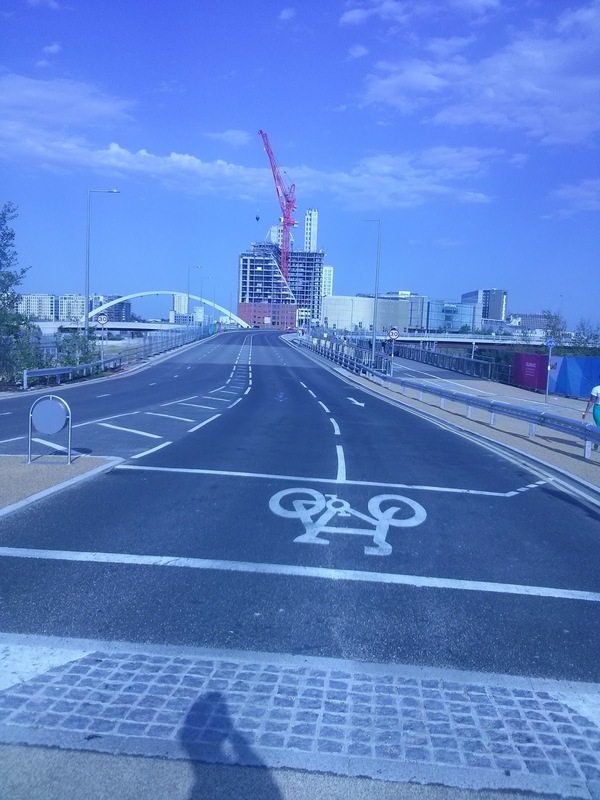 It is now the main road through the Olympic Park but the segregated cycle lane was removed and replaced with a dual carriageway, with a shared cycle lane painted onto a new pedestrian bridge alongside. 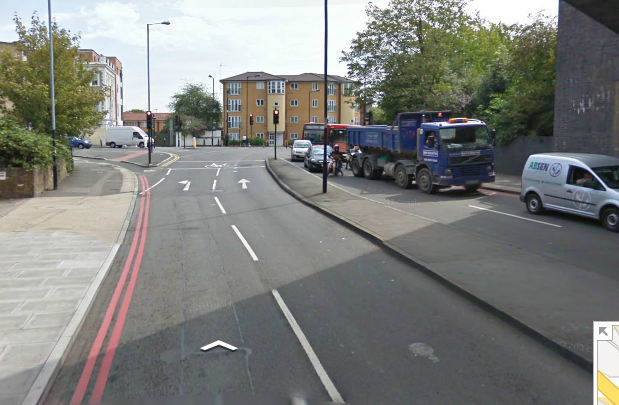 It had a fantastic left turn cycle lane which allowed you to continue left onto Eastway when the lights were red, and more importantly, it removed the threat of being crushed by a left turning lorry, something you see in news reports in London far too often lately. 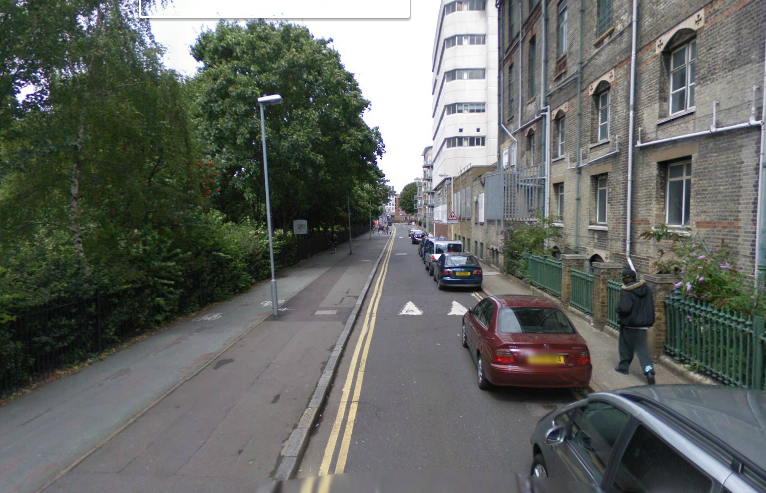 Here it is now, with the cycle lane removed. It is a scandal that this lane was removed. Hackney should have been copying this junction and installing this exact kind of cycle lane at major junctions all over the borough. 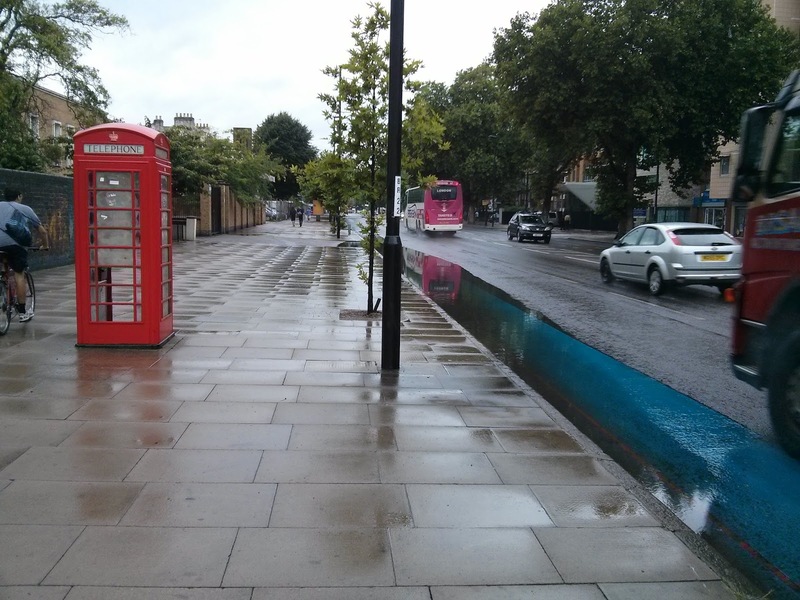 Not only that but TFL and other boroughs should have been copying it. Want to reduce lorry / cycle deaths at junctions? This is the way to do it, by physically separating them at junctions. Now I'm not suggesting you just slap down cycle tracks on all the main roads in Hackney and everyone simply gets on their bike. They need careful planning to ensure they are all direct so they actually take you from A to B. They need to be wide enough to accommodate enough people who want to use them. 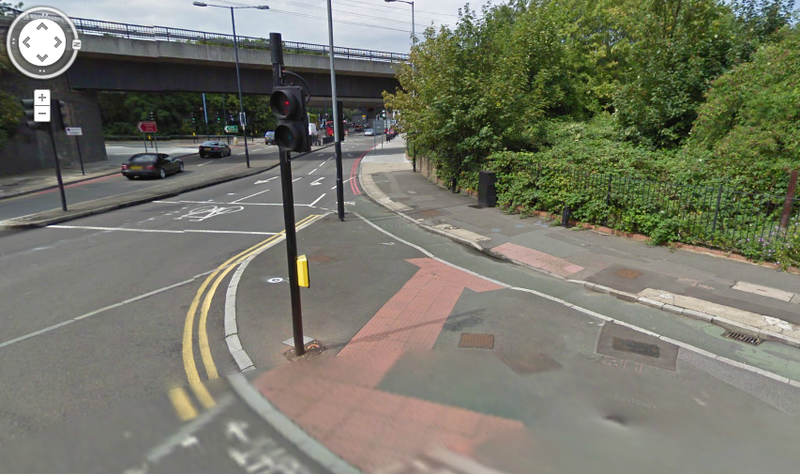 More importantly they need to be safe, especially at junctions, and also designed to allow people to cross the road. 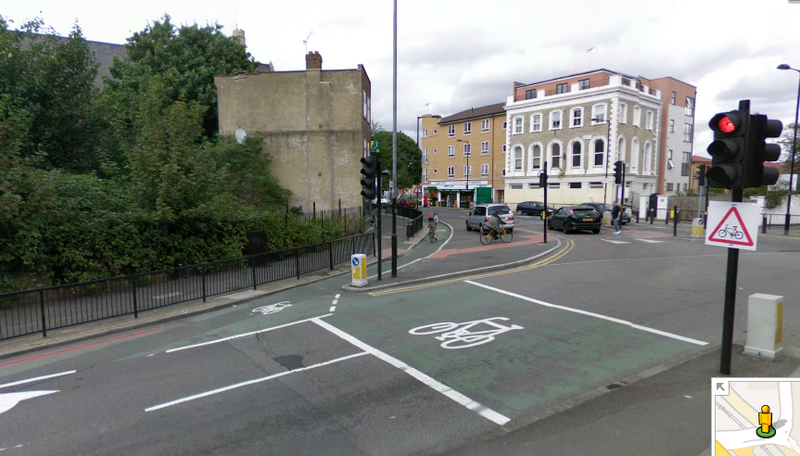 Other infrastructure also needs to be in place where bikes and motor vehicles mix, and some of it already is in Hackney. Things like filtered permeability, one way roads for cars which allow bicycles to travel in both directions, road surfaces that use material like cobbles to slow traffic down, etc. 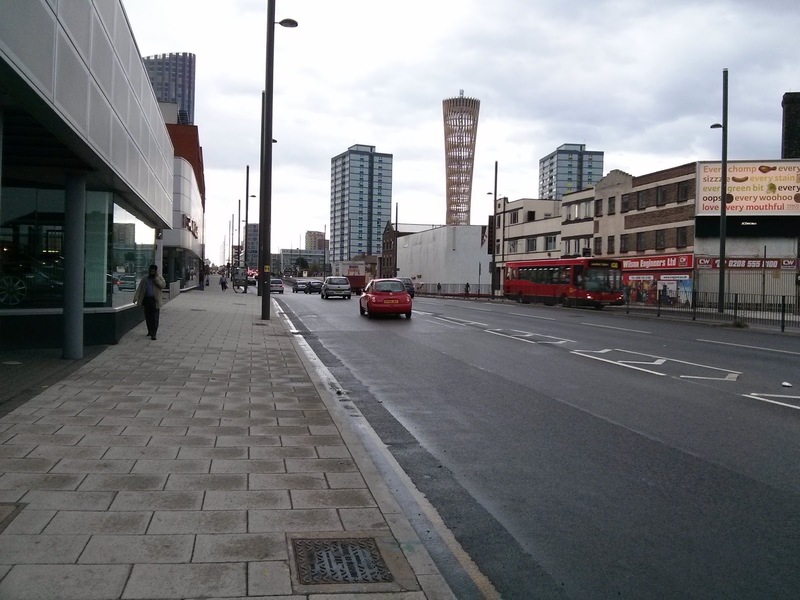 Until these lanes are built though the main roads in Hackney, like Mare Street, Kingsland Road and Old Street will continue to be dominated by motor traffic with most opting for the buses. You can talk about cycle training or 20mph limits but it won't make a difference. The vast majority of people simply will not cycle down a road like Old Street whilst they have to share it with buses and lorries. However they might if we look to other countries that have achieved far higher levels of people cycling than we have here in Hackney. 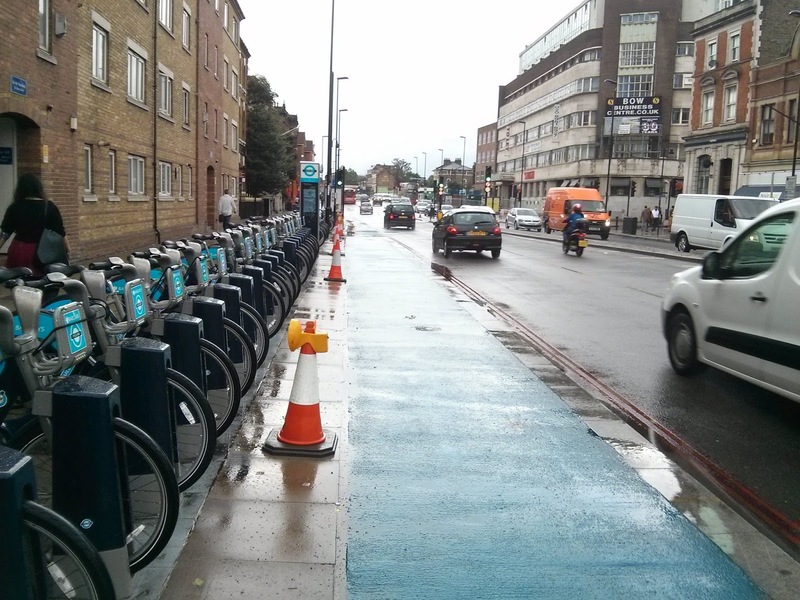 Or engage with people that do not cycle in Hackney (the vast majority) and start to build the infrastructure that will get them onto their bikes. Yesterday I went for a bike ride in the sun down the canal, past the Olympic Park and the old Big Breakfast house to Bow roundabout. 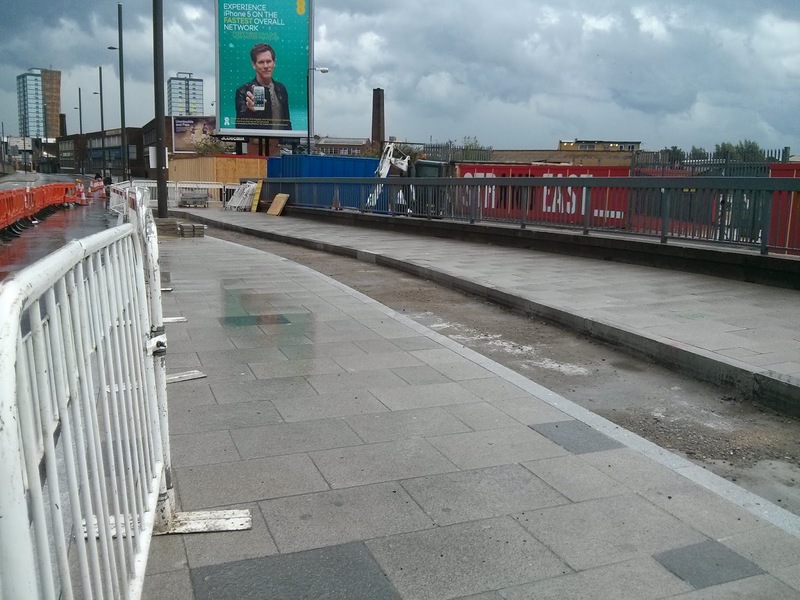 Up until two years ago if you wanted to continue after Bow towards Three Mills or Limehouse then you had to cross 4 lanes of traffic, with no crossings to help you along. 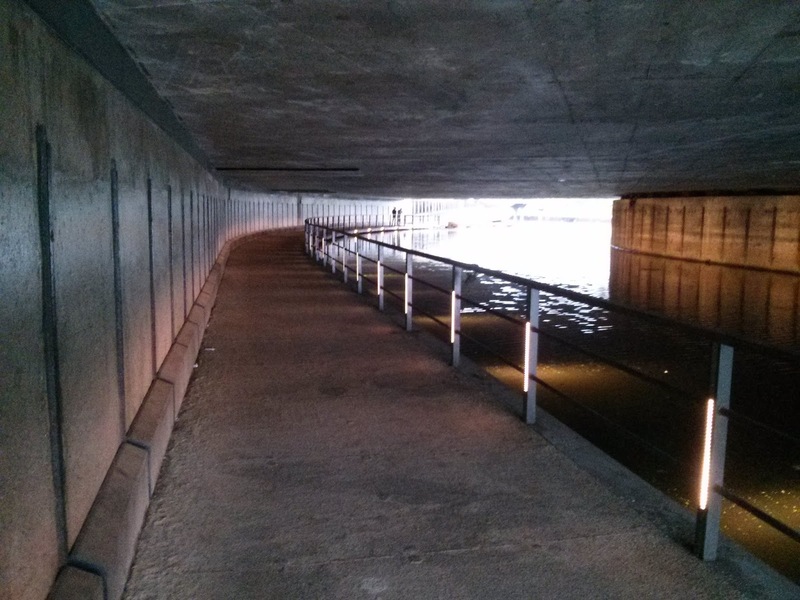 Now you have this nice floating towpath along the canal under the roundabout, which is handy as I took shelter on it when the sun vanished and the heavens opened. 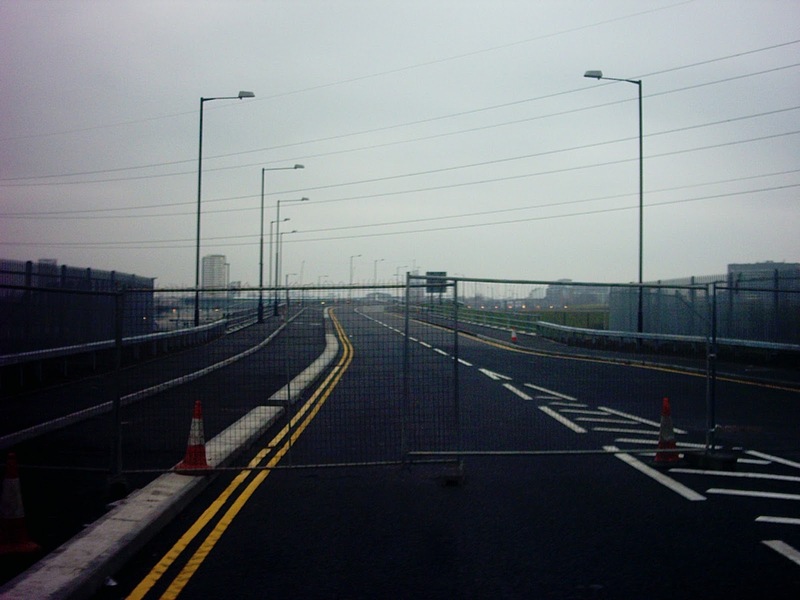 Cycle Super Highway 2 was opened in July 2011 and was originally due to go from the City to Ilford, however Newham council blocked it through their borough so it ended at the Bow roundabout instead. 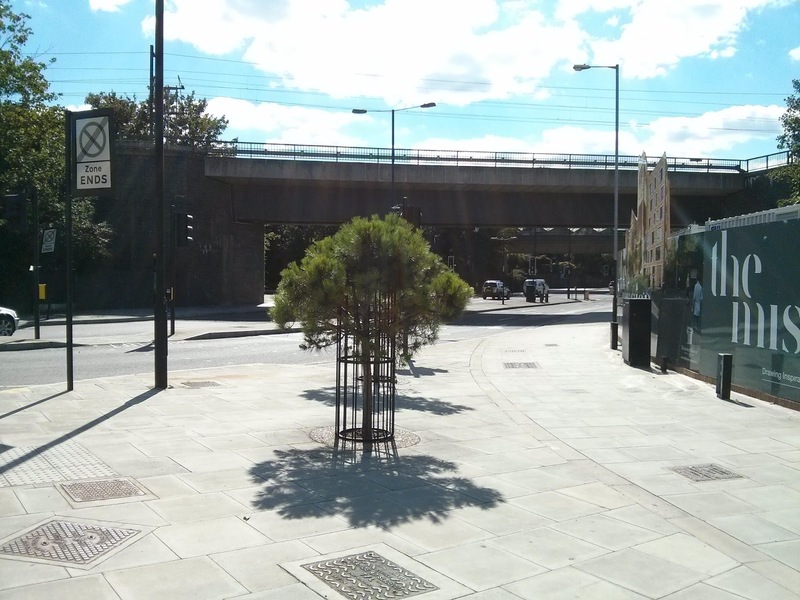 Since it opened two years ago three people have died cycling on it and two of those deaths occurred at the Bow roundabout itself; Brian Dorling on the eastbound approach, and Svitlana Tereschenko on the westbound approach. 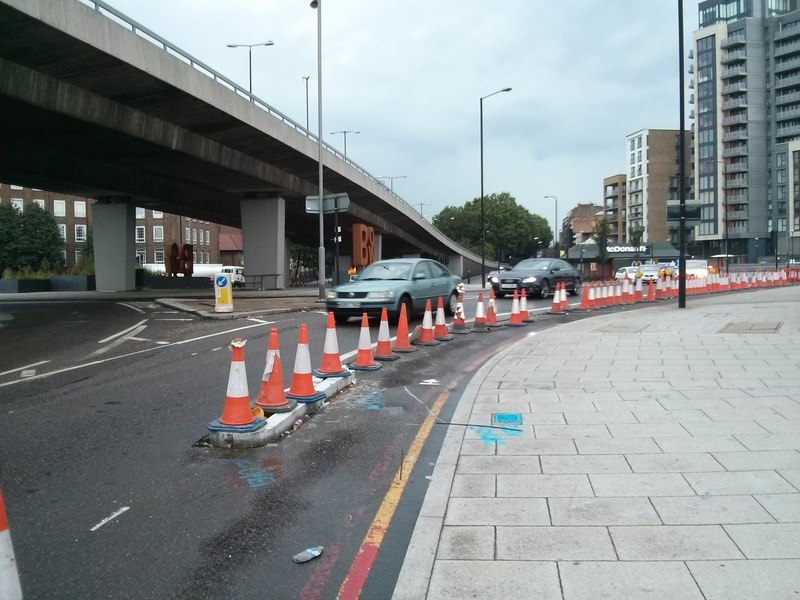 These two deaths forced TFL to make changes to the cycle lane layout at Bow. 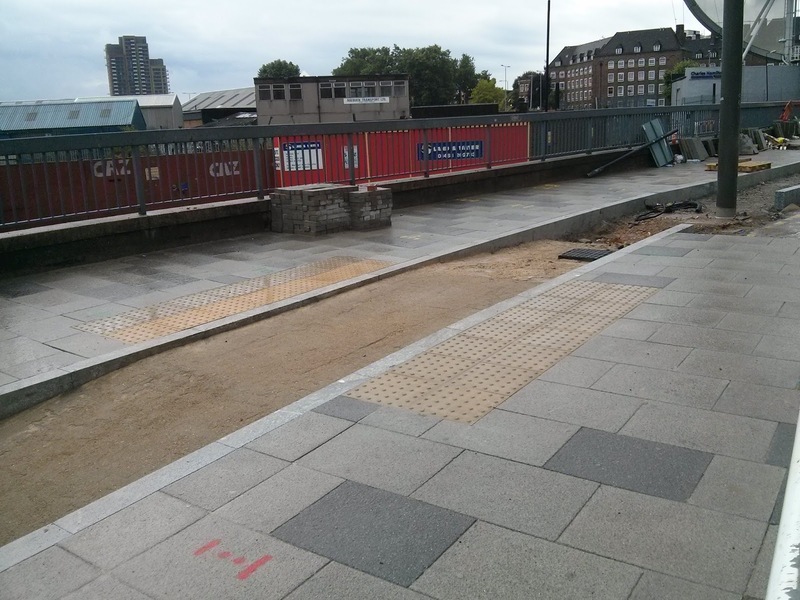 The eastbound approach was adjusted before the Olympics last year, as covered in some depth by Diamond Geezer here and on the 'as easy as riding a bike' blog here. 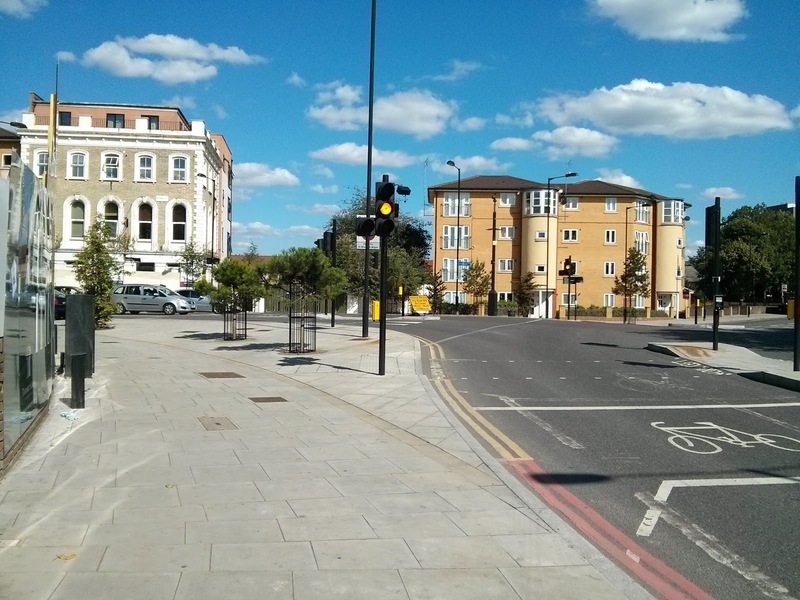 A very short segregated lane was built so people could reach the ASL and then the junction went from having three traffic lights to a total of eight traffic lights, including an annoying phase where the lights are red for people on bikes approaching the ASL whilst they are green for motor vehicles. 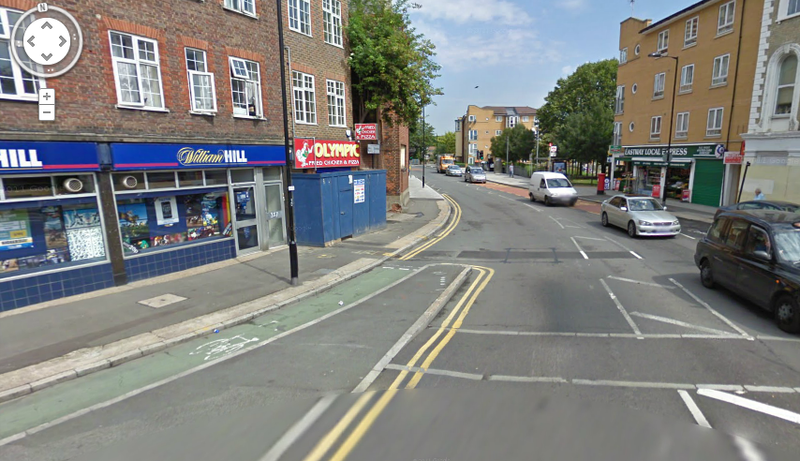 Annoying if you're cycling this way but TFL clearly hope this will guarantee no more deaths involving left turning lorries here, as technically either a bike or a lorry has to jump the red lights or a lorry has to illegally enter the ASL for them to meet. Yesterday the eastbound segregated lane around the roundabout was coned off, although I couldn't see any reason why, it seemed fine to me. 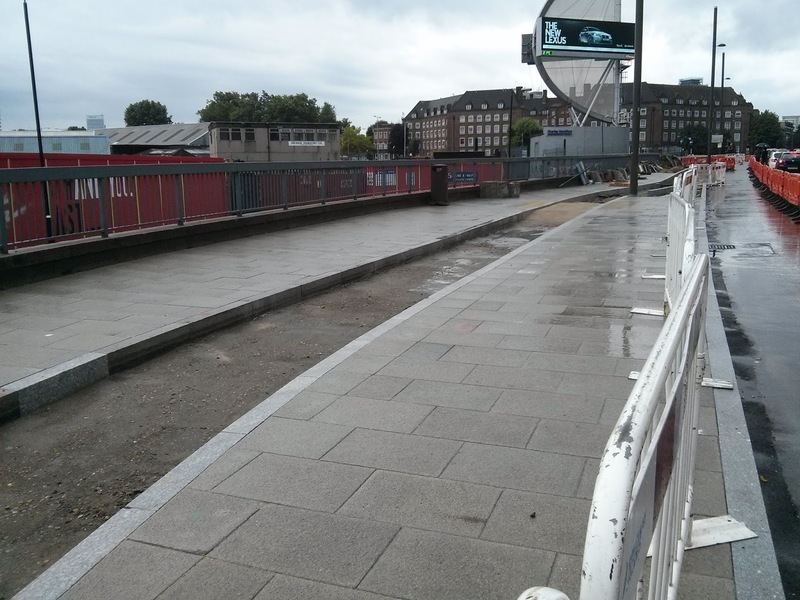 They haven't yet started building the extension of CS2 from Bow to Stratford, although it is due to open later this year. The road is very wide here and unpleasant to cycle along, but thankfully one of those traffic lanes will be removed to make way for a two metre wide segregated cycle lane. 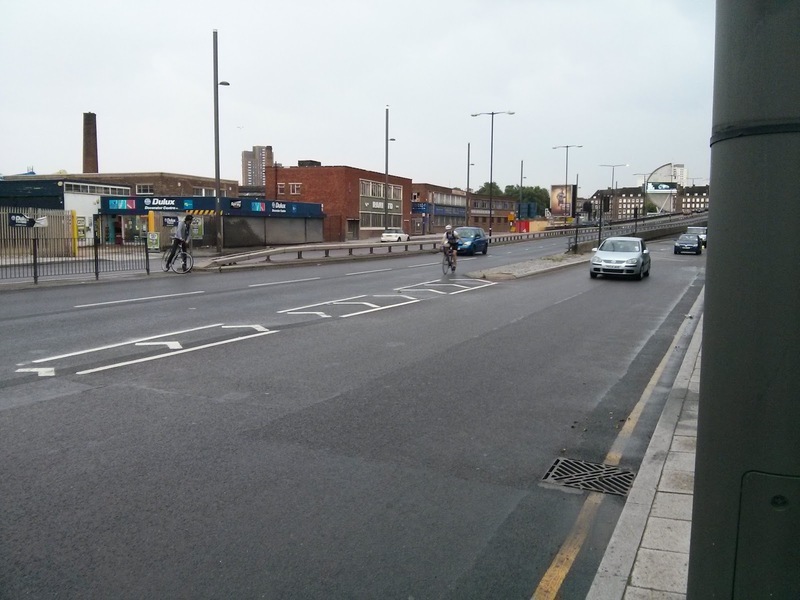 TFL themselves say about 60% of people cycling along here use the flyover and that figure seemed to be about right as I stood there watching everyone yesterday afternoon. To access the flyover you need to cross two lanes of fast moving traffic and then do the same as you exit the flyover but it is quicker to do this, there are no traffic lights up there and no danger from any left turning lorries. The lane looked a little on the narrow side to me but I'll reserve judgement until it opens and I actually get to ride along it. 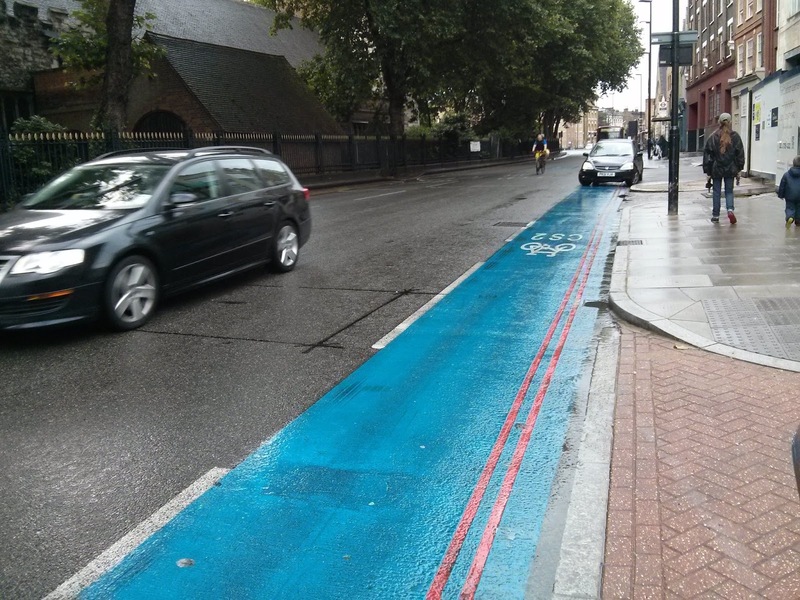 after this it is painted onto the road all the way to Aldgate where motor vehicles can legally travel in it. 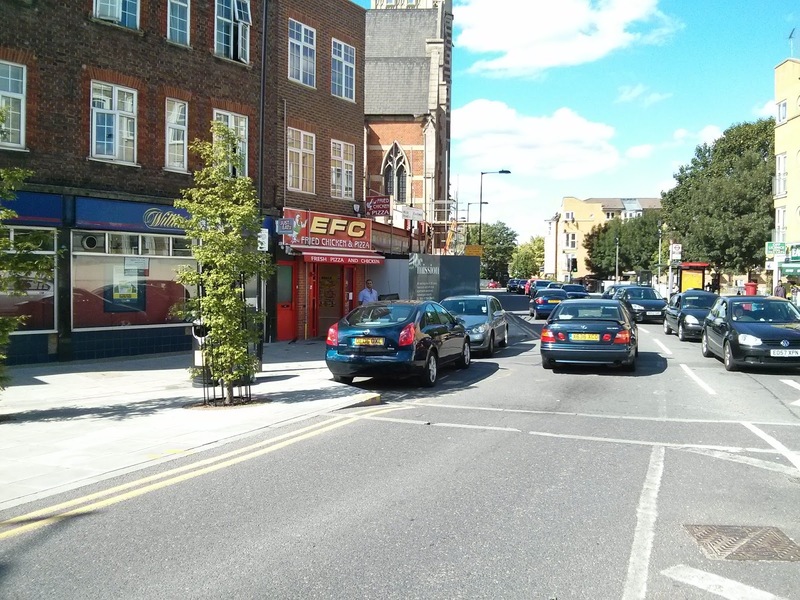 just look at the size of the pavement outside Bow Road station - the pavement on the opposite side of the road is also very wide showing just how much room there is on Bow Road. Indeed it used to have trams running along it, as well as all the other traffic. just send someone from TFL over to the Netherlands to see how it's done and copy them. It just works. 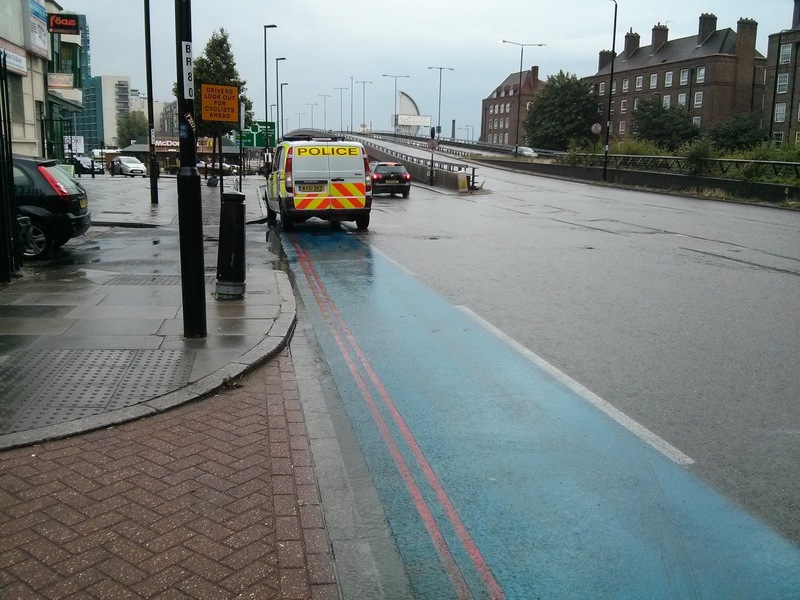 Strange that whist I was riding along CS2 yesterday assembly member John Biggs called for the entire route to be segregated from Aldgate to Bow and I agree with every word he said. 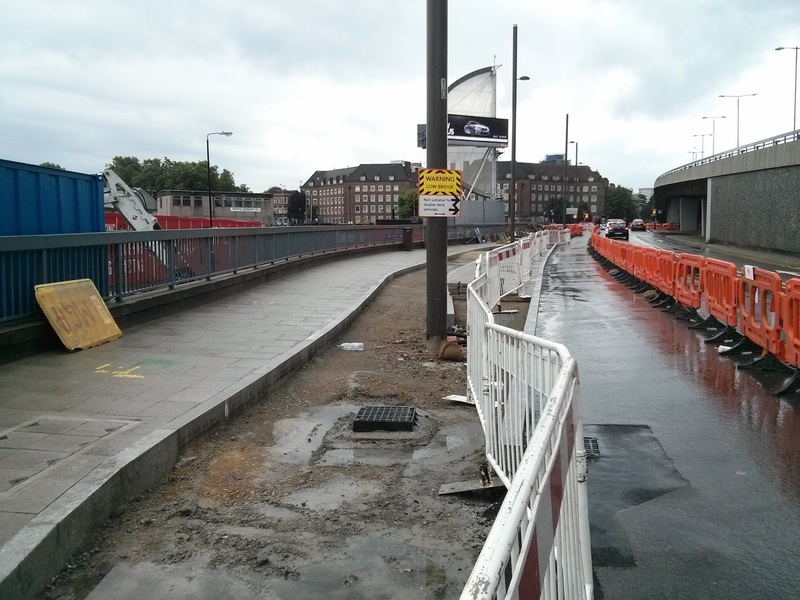 CS2 from Bow to Aldgate is simply not fit for purpose and needs radically upgrading before someone else dies riding along here.